In the race to have the best team, win the most games and make the most money, college sports programs have exploited student-athletes for university gains, according to some of the nation’s leading experts on race and intercollegiate sports. Those experts were gathered at Wake Forest as part of the “Losing to Win” conference. 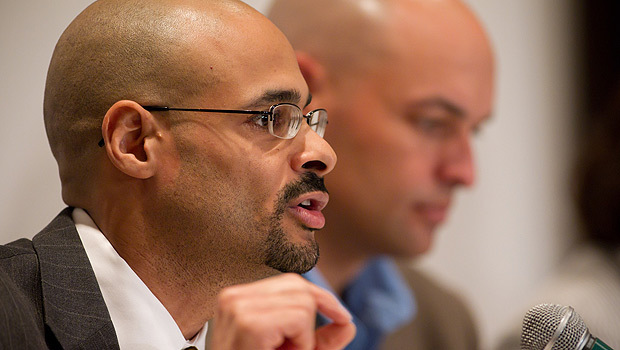 In their research into race and economics in college sports, Robert and Amy McCormick, law professors at Michigan State University, have found that student-athletes, particularly African Americans, don’t reap the benefits of their labor. Those athletes generate huge revenues for their schools. But, despite getting the opportunity to attend college at little or no cost, they often walk away without a degree or with a substandard education, the McCormicks say. All the while, the predominately white administrators of colleges and intercollegiate sports programs draw rich salaries and their schools build ever-better facilities. “A largely African American work force – the players – are generating a great deal of wealth by creating the product of college sports, but they are not allowed to share that wealth,” Robert McCormick said. The average future NFL draftee brings in $400,000 a year and a future NBA draftee brings in $1.2 million a year for their schools, according to Ahmed Taha, professor of law at Wake Forest University School of Law. If that athlete actually graduates with a degree, it yields them, on average, just $72,868 in annual earnings. And only 56 percent of the 2010 NCAA basketball tournament bracket schools graduate at least 50 percent of their African-American players, according to the Institute for Diversity and Ethics in Sport. Coaches and college sports administrators also are failing athletes when it comes to dealing openly with recruits who have criminal records, said Jeffrey Benedict, author of the recent Sports Illustrated special report “Criminal Records in College Sports.” His investigation found that, of the Sports Illustrated Top 25 preseason 2010 football teams, 7 percent of players (or 204) had been charged with or cited for a crime. Those players were implicated in 277 incidents. But only two of 25 schools conducted any kind of criminal background check on incoming football scholarship recipients – and only one school, Texas Christian University, had a roster free of criminal records. It’s not a matter of automatically disqualifying any recruit who has a felony record, Benedict said. “I don’t think that would be a good policy,” he added. If a coach decides to recruit a player with a record, however, the school should ensure there’s a safety net for that athlete – so he stays out of trouble and gets an education that prepares him for life after football. “Losing to Win” continues Thursday, April 14. The meeting launched a new blog on race and college sports; follow it at http://losingtowinblog.blogspot.com/ or on Twitter @losingtowinblog.